Njut av dina sinnen med denna gourmetmat och vinupplevelse vid ett århundradet gammalt toskansk bondgård. Reser genom de rullande vingårdarna och olivlundarna på landsbygden nära Florens för att komma fram till en arbetsgård och vingård i den berömda Chianti-regionen. Möt bosatta djur och tur på de historiska grunderna, och njut av en färsk, gård-till-bordsmiddag med lokala specialiteter tillsammans med en provsmakning av olika viner som Chianti och Prosecco. För en verkligt nedsänkt måltid kan du till och med hjälpa till i köket om du vill. Great guide and great food. Very enjoyable and very relaxed and comfortable. We enjoyed the conversation with the owner and the guide throughout dinner and enjoyed seeing the Tuscan countryside. Despite there having to be some alterations to the experience due to the overbooking of the original venue, Leonardo our guide made this one of the most memorable parts of our trip. Because it was the low-season this tour ended up being very much a private wine workshop and the highlight of our trip. We even had access to Leonardo's own winemaking experiment which we were lucky enough to take home with us. The Dinner was exquisite and the Florentine Steak was without a doubt our best meal of the trip. 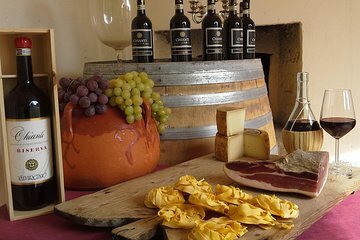 If you're looking for a chilled yet luxurious treat while in Tuscany then I would highly recommend booking this experience. This experience was fabulous! We loved the guide, the host, the food, the wine, and the location was really beautiful. The others who joined us were seeking the same kind of cultural experience and the evening was superb.